The canopy walkway is the latest facility introduced at Kuala Tahan and Kuala Koh Taman Negara. At Kuala Tahan the construction of the first phase of the canopy walkway which span across 231 metres was completed in 1993 and the second phase which is 200 metres long was constructed in 1995. The canopy walkway at Kuala Koh was which spans 230 metres was built on 2000. It installed about 30 metres high and stretching over 400 metres, this is the world’s longest canopy walkway. From here you get a closer look at life at the top of the world’s oldest tropical rainforest. Experience Canopy Walkway. “The Longest Hanging Bridge In The World”. Beautiful scenery of flora & fauna, tree species and bird watching. Enjoy a panoramic view of Gunung Tahan, Tree forest canopy and covering the hill and verdant valley at the top of Terasek Hill. Trek-walking at night at tropical forest and watch nocturnal animals and insects, listening to symphony of night creatures come alive in the jungle. View the wonders of luminous or fluorescent fungus and plants. -To explorer the limestones outcrops. -To catch sight of horseshoe bats, cobra, giant toads and termite colonies.Suitable for those who love adventures. Includes : Guide, boat, blowpipe demonstration & token gift. "Orang Asli " simple mean "original people" in Malay language. To know the culture is to know the people.The orang asli who continue to live a nomadic lifestyle and people who refused civilisation call themselves "Batek". The Batek are gentle race of people, short in stature, dark skin and with tight curly hair. Learn of their language and way of life and watch their fascinating bolw-pipe and fire-making skills plus the secret of Poison Dark (Damak) Making which are essential to their lifestlye. -Visit typical Malay Village at Kg Gol, Rattan weaving demonstration. -Meandering through palm oil plantation, one of the Malaysia economic resources. Clothing : Swimming suit & towel. 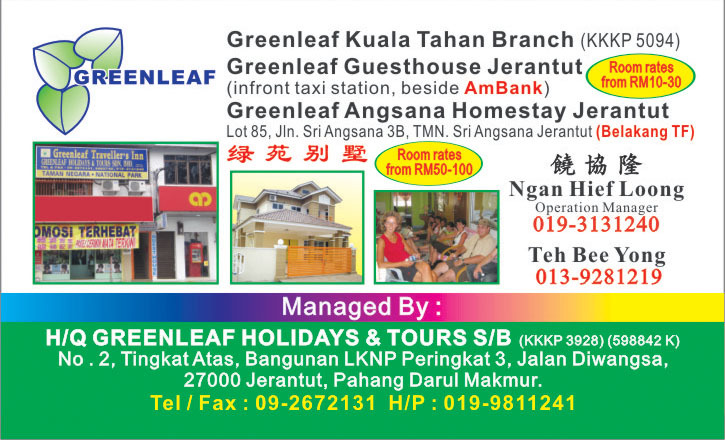 -Enjoy the panoramic views along river bank.Passage through tree canopy.Meandering through the Tahan River. -Enjoy the sound of the jungle.Swimming at the spectacular cascade natural Jacuzzi.Fishing/Birds watchingView the river habitats by chance: Water Monitor Lizard,River Otter Eagle, Hornbill, Heron. 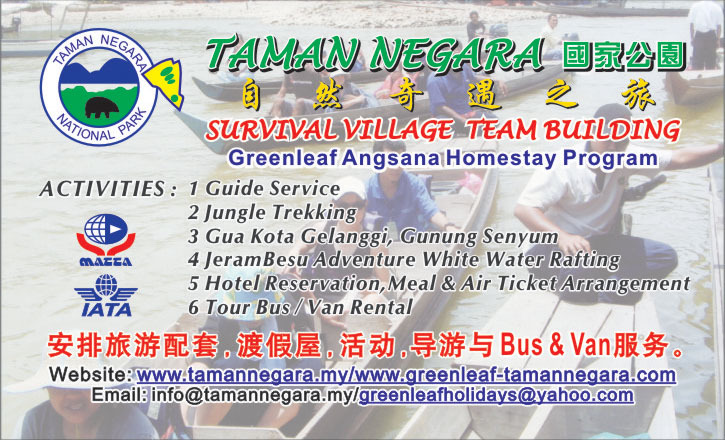 -Prepares to negotiate 7 major rapids from Kuala Terenggan to Kuala Tahan (9km) by rubber raft and enjoy a deep water at Dedari Waterfall with pack lunch in between of water rafting. -Experince the 7 major rapids: Nusa, Dua, Abai, Teras, Panjang & Terenggan. Enjoy the beautiful flora & fauna along the river bank. -Join us in a 4x4 vehicle in search of wildlife at night with flash lights, as most animals are active during the night. -Potentially seen wildcat, wild boar, slow loris, flying squirell, civet cat and others. -One time experience night fishing with expert boatman at Sungai Tembeling.Equipment provided. **Things to bring: T-shirt, Torch light, Sport shoe, Slipper or Sandal, Toilettries, drinking water, swimming suit.